Waterproof exercise sheet with cozy fleece inner & reflective strips, matches Amigo Range. Excellent for warm-up sessions, riding tours & following exercise/competition sessions. Water-based, self-cooling blanket reduces deep tissue temperature by as much as 30 degrees F.
Fits perfectly under the exercise saddle without any excess fabric under the rider's leg. Wrap-around design to use under saddle flap or over rider&apos;s legs. 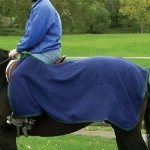 A winter version of the riding rug with a soft, highly insulated fleece lining. This rug fits well around the saddle and is attached over the withers with Velcro. 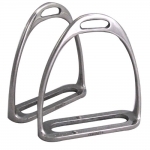 Don't get caught ring side in the rain again, with full neck design, stirrup slits, belly straps & storage bag. A unique design to keep the horse warm while not restricting exercise. ShireTex 600D ripstop, reflective strips, touch-to-close front fastening and a fillet string. Perfect for exercising! Waterproof and breathable 600 Denier ripstop fabric.